Deniers at WUWT are (belatedly) trying to shoot down a paper published in Nature GeoScience last month. It's from authors who are part of the Ocean2k project, the ocean component of the PAGES 2K international consortium. The lead author is Helen McGregor from the University of Wollongong in Australia. Anthony Watts was first to protest (archived here). In a bout of denial at WUWT, he claimed that just because there were a lot of volcanic eruptions on earth from somewhere around 1200 AD to 1800 AD, it doesn't mean they caused the observed cooling. He wrote a headline: "The new poster child for ‘correlation is not causation’: industrial revolution ended 1800 years of volcanic induced cooling". In that one headline he rejected both greenhouse and volcanic forcing. Naturally, he didn't say what he thinks caused the earth to cool over time, or what is causing the current warming. More of the WUWT magic? Anthony's protest was weak. It consisted mainly of his headline, and a complaint that there was another press release about it recently. He didn't notice or know about the press release when the paper was first published. He later added an update that denier blogger Steve McIntyre was writing about it, though Anthony didn't understand what Steve was writing. (And I doubt that Steve McIntyre understood what he was writing either going by his past performance.) Anthony can't even get denier articles right. 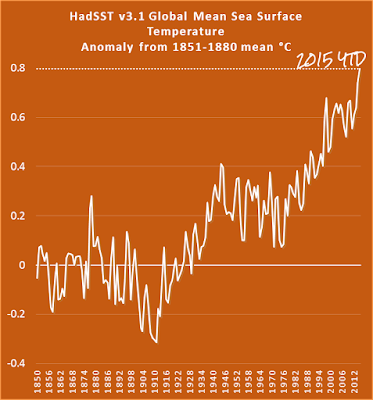 Compare what Anthony said: "Steve McIntyre looks at the oceans2K data, and surmises it’s a bit hyped up." with what Steve McIntyre wrote, which was the opposite: "One of the reasons for the strange lack of interest..."
It shows the data in 200-year bins, centered in the middle of each bin, so the first bin is from 0-200 AD and the last bin is from 1800-2000 AD. I saw that graph and I said “Huh?” The change from 1700 to 1900 is not anywhere near 20 times as steep as the drop from the start of the study to the present, as Michael Evans claims. That is simply not true. Yet Willis didn't provide any evidence to show whether it was true or not. Below is the top part of Figure 2 from the paper. I've added the caption from the paper. The bin on the left is from 1 CE to 200 CE. The bin on the right is from 1801 to 2000. Click the image to enlarge it. Figure 2 | Ocean2k global SST composite and sensitivity analyses. a, Standardized Ocean2k SST synthesis. Lines are the N = 57 reconstructions, coloured by ocean basin (see b). Box plots show 25th to 75th percentile range (black box), median (black horizontal lines) and outliers (red crosses) to approximately 99.3% of the data range (black dashed lines and caps (‘whiskers’)) assuming normally distributed bin contents (Methods). Thick black line is the median of the ocean basin area-weighted composite (Supplement section 5). You can see from the above the distinct cooling trend from around 801 CE onwards, and particularly from around 1200 CE till recently. Some further explanation of the work is important. The paper is the report of an effort by 15 researchers to analyse 57 different sea surface temperature reconstructions so as to develop a global reconstruction of sea surface temperature anomalies going back 2000 years. They put the data from these 57 separate reconstructions into 200 year bins, which allowed them to see long term trends by basin and overall. (This wasn't a simple task. The researchers had to make sure they were comparing like with like. The paper and supplementary information describes how they did this.) They also compared the result to land-based reconstructions, and found similar patterns. What they found is shown in Figure 2 above. That there was a distinct cooling from around a thousand years ago to around 1800. To investigate the cause of the cooling trend, the researchers turned to climate models. They examined how sea-surface temperatures reacted to various "forcing" factors, such as changes in solar output, Earth's orbit, land use, volcanic activity and greenhouse gases. Only volcanic events resulted in a cooling trend that matched the team's real-world observations. The paper itself was focused on paleo records from proxy indicators of sea surface temperature for the pre-industrial era. What has happened in the instrumental era? Well, there are modern reconstructions based on instrumental records. Here is what's happened to sea surface temperature since 1850, from the UK Met Office HadSST record. I've plotted it as an anomaly from the 1851 to 1880 period. 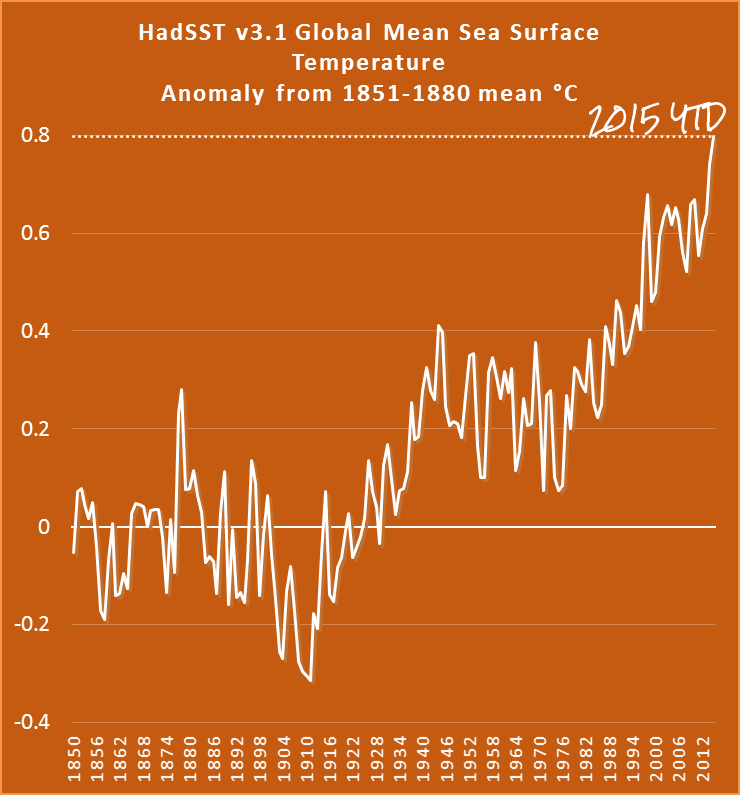 Does Willis Eschenbach not know that sea surface temperatures have been going through the roof? I've noticed that Willis doesn't talk about or plot surface temperatures on land or sea very often. He can't face the fact that he's wrong when he claims that temperatures only fluctuated "±0.3°C over the 20th century". They didn't. Temperatures have been going up and up, not up and down. "No matter how we divided the data set, the cooling trend stands out as a robust signal," McGregor said. Today, the Earth is warming about 20 times faster than it cooled during the past 1,800 years. I cannot object in strong enough terms to professionals passing this nonsense off as science. They’ve included several short segments that show the Pacific warming very rapidly, along with another short segment showing it warming and then cooling, and a final short segment that shows it not changing at all since the year 1300… how can anyone mistake this foolishness for actual scientific findings? All that shows is that Willis doesn't know how to interpret data. Remember, this is the same Willis who can't tell the difference between a feedback and a forcing, and who thinks he was the first to discover tropical thunderstorms! The temporal diversity and spatial distribution of the 57 reconstructions present methodological challenges for generating a global synthesis product. 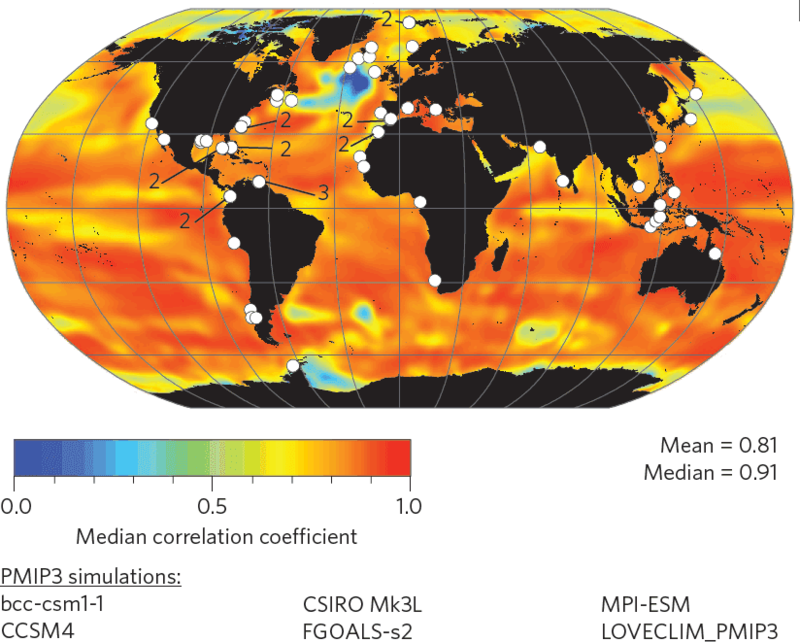 Figure 1 | Correlation map and locations of the 57 reconstructions in the Ocean2k SST synthesis. Map is based on six climate model simulations for the interval 801–1800 ce (Supplementary Table S4). For each simulation, SST data were composited into 200-yr bins, and the correlation between grid point SST and model global average SST was calculated (Supplementary Section 5). The map shows the six-model median correlation coefficient (colours). Numbers indicate where multiple SST reconstructions are from nearby locations. The correlation map qualitatively suggests that mean SST at the 57 locations is representative of global mean SST on centennial timescales. As the caption states, the above map is based on climate model simulations. The locations of the 57 reconstructions are shown as white dots. The list of 57 reconstructions is provided in Table S1 in the supplementary information (pp 6-10). It's only when the data are analysed and combined in the manner that the Ocean2k team did that you can get an indication of global changes over time. Willis Eschenbach is blowing smoke - and as usual, doesn't know what he's doing. Had the results been more HS-like, it’s hard to believe that the OCEAN2K authors would not have found a way of publishing them in time for AR5. It seems to me that, since the results were “bad”, the authors seem to have felt little urgency. His "HS" stands for hockey stick. And he thinks the results were bad? He doesn't explain why he thinks that, except that he couldn't find his hockey stick. That's because he was looking in the wrong place. Apparently Steve isn't aware of the fact that there is a modern instrumental record. He didn't read how the paper was about proxy reconstructions, focusing on pre-industrial times. Which is odd, since it was in the title. This is a mixed bag. As usual, I've linked to each comment. A lot of deniers seem to confuse the science around the medieval climate anomaly and the Little Ice Age. That's what comes of reading pseudo-science instead of science. Clearly Mann’s graph didn’t go far enough, temperature wasn’t flat it was cooling! If the paper wasn’t paywalled it would be worth reading for a laugh. Poor whiten has got all befuddled with all the different conflicting denier memes. That's what comes from sticking to climate conspiracy blogs. He or she doesn't know what to think and is definitely missing more than something. Maybe I am missing something here, gone too quickly through this one,,,,,,but is basically the claim in this one that the industrial revolution started before LIA ended?! Did actually the industrial revolution started by 1660?! Are this guys claiming that their models are better than GCMs, when GCMs actually somehow show that there is no any global warming due to CO2 emissions either natural or human prior to 1960? Can some one be kind enough to explain the actual point of this study, if I have got it wrong in principle?! Bryan A almost has a breakthrough. The light switch is there within his reach but he can't quite make himself flip it. What I read in it was that the “Cooling” (into the LIA) was presumably caused by Volcanism over an 1800 year period while the Warming (assumed from Industrial CO2) of the last 200 years is a driving factor of industry CO2 production. Keep going Bryan A. You're almost there. What happened at the end of the Little Ice Age? The volcanic forcing abated. What happened during last century? A huge increase in atmospheric greenhouse gases. And they are still increasing. That's why the sea surface has been getting so hot lately. Nick Stokes makes a valiant effort to inject some reason at WUWT. As they say, the data are binned, in 200 yr lots. “1900” means anything from 1800-2000, and so does include some modern warming. But the resolution is far too low to look for anything reliable about the last few decades. This is a proxy based paper about the cooling stage. Information about the modern warming stage should be instrument based. The Auditor also recently doubled down (backup) on these insinuations. Steve McIntyre still hasn't admitted that it was the authors of Marcott13 themselves, in their own paper, who warned that the most recent observations were not robust. (They wrote about the period 1890 to 1950 that "... considering the temporal resolution of our data set and the small number of records that cover this interval (Fig. 1G), this difference is probably not robust." Steve pretty well ignored the substance of Marcott13, which was the previous 11,000 years. Steve doesn't admit that modern instruments can detect temperature on land or sea. He's a thermometer denier, like Willis Eschenbach. He also denies the major flaws in his own work, which is all derived (Steve piggy backs on the research of other people, and usually gets it wrong). Yes, further down that thread I noted how The Auditor's complaints about Ocean2k contradict his Marcott13 protests. It also turns out The Auditor was involved in the Wegman Report's 100:1 cherry-pick to a greater extent than I'd previously realized. "Steve piggy backs on the research of other people"
It's a bit like the sparrow of proverb who would be king of the birds by flying off the back of an eagle. Only this sparrow can just plummet. There is also an FAQ on the PAGES2K website for the study. Thanks Ceist. I've added a link in the references section to the article above. To keep up readership, it's important to post alarmist headlines. Doesn't matter of course if they are true or not, or if the article is accurate, timely, or relevant. In a pinch, you can use conjecture to prove your case and let your idiot commentators embellish with straw arguments. WUWT does this on every. single. article. The site is a joke. I suspect they have taken pointers from Matt Drudge and other connedspiracy sites. Readership and ad revenues go up the more you scream and bring attention to yourself. But just like badly behaving children, it doesn't take too long before they get ignored by the better-informed. WUWT tries the patience of scientist and saints. That you keep pointing out their inane stupidities and asinine conspiracy puts you in the latter crowd. Me - I'd rather just take them all out and deep-six them. The damage they are doing is incalculable. Spreading lies about what's really occurring and how this will harm humanity is simply unforgivable. Just wait until enough research accumulates to justify correcting the anomalously high wartime sea surface temperature measurements made from 1940-1946. The shrill cries of outrage will be audible across oceans. Occasionally, I get the impression that the desired outcome pre-empts the science. More shrill than that, please. When that impression creeps over you, you should reflect a bit on the context. It is what you do all the time. Magma did not do this. Note the important qualifying phrase - "wait until enough research accumulates to justify ...". That is the crucial difference between people like Magma and people like you. "Sou the sook" strikes again!!! Your pushing some touchy buttons again, Sou. Quite funny to see someone call you a "sook"...anonymously. I think our anonymous friend is pining for his pause. Name calling and tantrums are to be expected. Was the current rise in global temperatures predicted by Farce X and the Notch? How will our new chum cope with a temperature plot that insists on looking even more like a hockey stick? Can't speak for anon. However already some deniers at WUWT are hinting Roy Spencer and John Christy (UAH) are part of the climate conspiracy (see here). It's only a matter of time before they turn on RSS as well. I see dbstealey informs the faithful that the record temperatures are due to an El Nino. He does not deign to inform anyone why this El Nino is hotter than every other El Nino on record, and the congregation dutifully neglect to ask him that question. Is this a shift? You mean he's admitting that it's getting hot? He's not claiming that every single thermometer everywhere in the world, and satellites, have been tampered with by climate cultists? I doubt it. From his past efforts I suspect he will maintain two equally stupid strands of denial. 1. Any long term trend is because we are coming out of an Ice Age. This is a very unusual Ice Age which was not caused by any observable natural factors. Umm .. a natural factor that could be powerful enough to so significantly affect global temperatures while at the same time it is entirely undetectable by any other symptom of its presence? That's supernatural, aka climate elves. 2. There is no long term trend, its all down to evil lefty climate scientists 'adjusting' the temperature data. Unfortunately every single honest climate change denier out there is a bit too busy at the moment to do the maths and come up with an alternative temperature record, except Richard Muller who turned out to be another evil lefty despite Auntie Judith helping him. And anyway, Richard announced his results before publishing his paper: which only Anthony is entitled to do, so it doesn't count. Confused? You won't be after the next episode of WUWT. An Arab market, I think. The term is also used to indicate an anonymous coward. As Anthony often refers to anonymous cowards - causing much hilarity here as, among anonymous WUWT fanboys, only lefty commie warmists can be anonymous cowards, the original poster may have been making a joke rather than intending to offend anyone here. In Australia, the word "sook" means a cry-baby. Someone who is timid and easily upset to the point of running to mummy or daddy and whining at the smallest incident. Off topic - but Roy Spencer has pulled his blog article of 12 September claiming record low tropical cyclone activity. Tropical Cyclone ACE is currently 153% of year to date norms. I guess he figures its better to pull the blog page - rather than be shown to be wrong. It looks as if he thinks his chart from Wunderground.com was wrong.